Murder by Gaslight: A Moment of Agony. 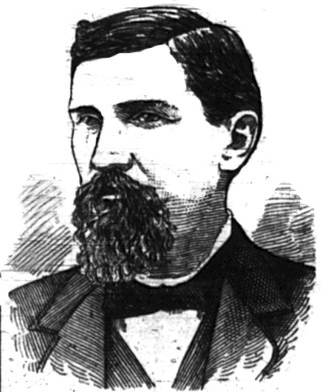 Albert E. Hauntstine had been a fugitive for nearly two weeks before being apprehended on November 22, 1888, in Columbus, Nebraska, by Platte County Sheriff Bloedorn. After his apprehension, Haunstine was described as “a harmless, innocent looking young man of about twenty-five.” But Haunstine’s mild appearance belied the brutal nature of his crime, he shot Hiram Roten and William Ashley in the head and tried to hide their bodies in a haystack on his farm in Broken Bow. A reward of $900 had been offered for his capture. When he was arrested Haunstine was armed with two Navy revolvers, a Winchester rifle, a derringer, and plenty of ammunition but was overpowered before he could make a move. Haunstine admitted his guilt when captured and said that Roten had been one of his best friends but could offer no reason for the murders. The story came in from Broken Bow that Roten and Ashley were school officers in Custer County who went to see Haunstine on November 9, regarding their suspicion that he had stolen a clock and some furniture from the schoolhouse. Three days later Roten and Ashley had still not returned, and their friends began a search which ended in the haystack at Haunstine’s place. 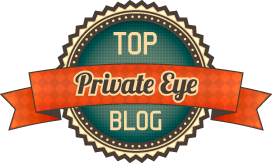 Both men had been shot through the head and Roten’s face had been badly eaten by hogs. The following April Albert Haunstine was tried for first-degree murder and was easily convicted. He was sentenced to hang on September 6, 1889. Haunstine’s attorney requested a new trial on technical grounds, and when the request was denied by the district court the case was appealed to the state supreme court. The hanging was postponed and Haunstine remained in prison for more than a year before the supreme court affirmed the district court’s ruling in January 1891 denying him a new trial. Haunstine was sentenced to hanging on April 17, 1891. As Haunstine awaited his execution, his friends were hard at work trying to convince Nebraska Governor Boyd that Haunstine could not have committed the crime unless he had gone insane. His behavior had been erratic since his capture and his supporters declared it would be a shame to execute a crazy man. The governor finally yielded to the pressure and convened a jury to determine whether or not Albert Haunstine was insane and sent Drs. Knapp and Carter to examine the prisoner and report their findings to the jury. As of April 17, the jury had not yet decided Haunstine’s fate. The sentence had ordered that Haunstine be executed sometime between 10:00 a.m. and 8:00 p.m.; at 9:15 that morning, the governor signed an order granting Haunstine a thirty-day reprieve while the jury finished its work. This news was received with much indignation in Broken Bow where the general belief was that Haunstine was not crazy but had been feigning insanity since his arrest. The governor had been unaware when he signed the reprieve that the jury had come in at 1:00 that morning with a verdict that Haunstine was sane enough to hang. When the governor learned the verdict he did not rescind his order but fixed May 22 as the date of Haunstine’s execution. Feeling ran high in Broken Bow on April 17, and some of the most hot-headed openly declared that if Haunstine was not hung by 4:00 a mob would be organized to break into the jail and lynch the murderer. It was not an idle threat, that afternoon, a mob of 200 to 300 men armed with crowbars and sledgehammers, led by friends and relatives of the murdered men, descended on the jail and demanded the key to Haunstine’s cell. They were stopped by Sheriff Jones who told them he would only give up the keys with his life. Sheriff Jones addressed the crowd as did ex-sheriff Penn and two other public officials. The authorities managed to placate the crowd and there was no further violence that night. A mob formed again on May 22 when the sheriff tried to hold the hanging privately, behind a wire fence and a tall enclosure made of rough boards. At 12:30 Sheriff Jones led Haunstine, accompanied by two priests, up the stairs of the gallows. At this point, a cousin of Hiram Roten, one of Haunstine’s murder victims, sprang on the scaffold and gave a signal to the crowd outside. Immediately, the crowd rushed forward over the wire fence and despite the efforts of the deputies, they tore down the enclosure and ran toward the gallows. Sheriff Jones came forward and again subdued the crowd. He addressed the crowd saying that they had violated the law and were subject to penalties, and asked them, in the name of humanity, to act like men. He asked all who were willing to do this to hold up their hands. The crowd became quiet and all of them raised their hands. The trap was sprung at 1:00 and the body dropped down but the rope snapped with Haunstine's weight and he fell to the ground beneath the scaffold. Sheriff Jones and his deputies rushed down the stairway, gathered him up in their arms and carried him back up to the platform. On the way up Haunstine gasped to the sheriff, “Please, Jim, loose the rope so I can get my breath.” But the rope was too tight and the sheriff could not loosen it. The men quickly retied the rope and at 1:02 the trap was sprung again. This time Haunstine was “launched into eternity” and was pronounced dead eleven and a half minutes later. 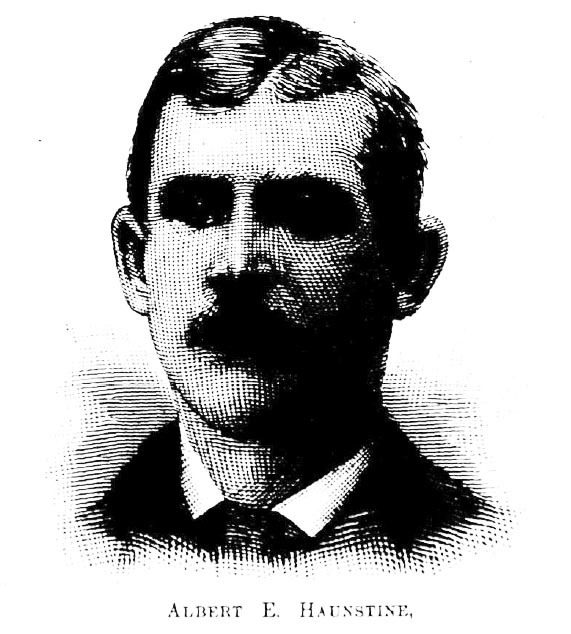 “Albert Haunstine,” National Police Gazette, December 15, 1888. “Given a Reprieve,” Lincoln Journal Star, April 17, 1891. “In the Merry Month of May,” The Nebraska State Journal, April 18, 1891. “A Moment of Agony,” The Nebraska State Journal, May 23, 1891. “The Murderer Arrested,” Daily Nebraska State Journal, November 23, 1888. “Not Well Enough Armed,” Daily Inter Ocean, November 24, 1888. “The Sheriff was Firm,” The Nebraska State Journal, April 18, 1891. “To Hang April 17,” Lincoln Evening Call, January 3, 1891. The Bitter Fruit of a Jest.